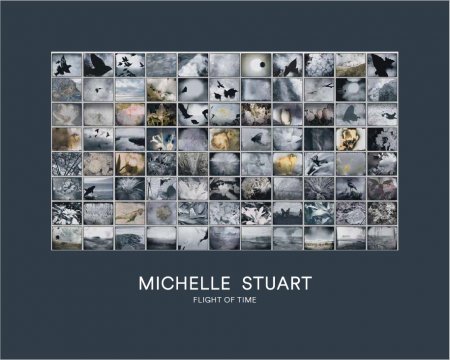 Galerie Lelong & Co. is pleased to present Michelle Stuart: Flight of Time, the artist’s first solo exhibition at the gallery since joining in 2018. The exhibition will feature drawings, photographs, and sculptures that span over forty years of her remarkable oeuvre. Stuart has worked on both a monumental and intimate scale to excavate universal human experiences, from collective memory to the natural landscape. 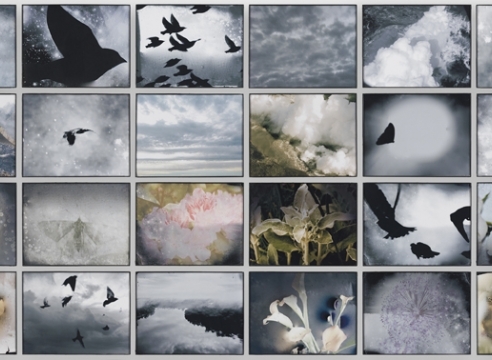 Similarly, Flight of Time (2016), from which the exhibition takes its name, intersperses found photography with the artist’s own images to coalesce a myriad of movements in nature, from entomology to botany. Originally exhibited at the 57th Venice Biennale, VIVA ARTE VIVA in 2017, this will be the first time the work is shown in the United States. Stuart also confronts challenging questions about human behavior in the Anthropocene epoch. In While We Went About Etherized (2012) and Landscape of Evil (2008-11), Stuart interweaves images of war with primal scenes in nature. The indexical, serial quality of Stuart’s photography recalls her earlier works from the 1970s. Stuart took materials such as earth and rocks from different locations, rubbing and pounding them directly onto paper in the studio until they attained an almost mineralized surface, naming the work after the site. In scrolls such as Zacaba (1978), Stuart confronts the divergence between physical space and embodied memory, the “natural” versus artist-made. A catalogue featuring an essay by Barry Schwabsky will accompany the exhibition. Stuart was recently featured in the 57th Venice Biennale, curated by Christine Macel; Virginia Woolf: An Exhibition Inspired by Her Writings, Tate St. Ives, England; and Cosmogonies, au gré des éleménts, Musée d'art moderne et d'art contemporain, Nice, France. In 2016, Stuart presented a solo exhibition at The Bronx Museum of Arts, New York. Her Sayreville Strata Quartet (1976) is currently on permanent view at Dia:Beacon, and her work is also currently featured in A Body Measured Against the Earth, MCA Chicago; After Babel, Megaron, The Athens Concert Hall, Greece; and Territorios que importan: Arte, género y ecologia, Centro de Arte y Naturaleza, Fundación Beulas, Huesca, Spain. Stuart’s most notable accomplishments include receiving the Anonymous was a Woman prize (2017); American Academy in Rome Residency (1995); and the Guggenheim Foundation Fellowship Grant (1975). Her work can be found in public collections worldwide including The Art Institute of Chicago; Centre Pompidou, Paris; Glenstone, Potomac, Maryland; The Menil Collection, Houston, Texas; The Metropolitan Museum of Art, New York; MoMA, New York; National Gallery of Australia, Canberra; SFMoMA, California; Tate Modern, London; Walker Art Center, Minneapolis, Minnesota; and Whitney Museum of American Art, New York. Stuart was born in Los Angeles, California, in 1933, and lives and works in New York, New York. Stuart is also represented by Marc Selwyn Fine Art, Los Angeles, and Alison Jacques Gallery, London.